Frank Lloyd Wright’s Guggenheim Museum in New York is one of the most famous contemporary art institutions in the world, and yet part of that fame, lending the place a kind of quasi-notoriety, is the idea that the building itself isn’t actually a great venue for showing art. Or as architecture critic Paul Goldberger wrote a few years ago in The New Yorker, “the charge that the building upstages the art has become part of its legend.” In my experiences at the Guggenheim, I’ve found that the legend often holds true — the perpetually sloping spirals of the space make for excellent wandering but distracted art viewing. 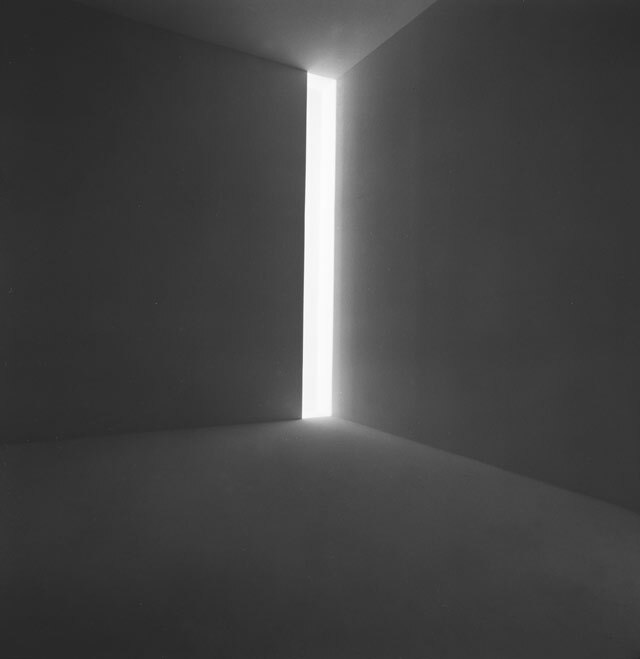 Tomorrow, however, an exhibition devoted to Light and Space artist James Turrell opens at the Guggenheim. Its centerpiece is a new work called “Aten Reign” (2013), which was made specifically for the building and uses the architecture in ways Wright likely never imagined. “Aten Reign” is stunning, and in it, the Guggenheim Museum — the actual physical structure — may have finally found its match. Confined to the museum’s rotunda, the piece can only be experienced from below, aka the ground floor lobby, where a series of reclining benches have been installed along provisional walls. 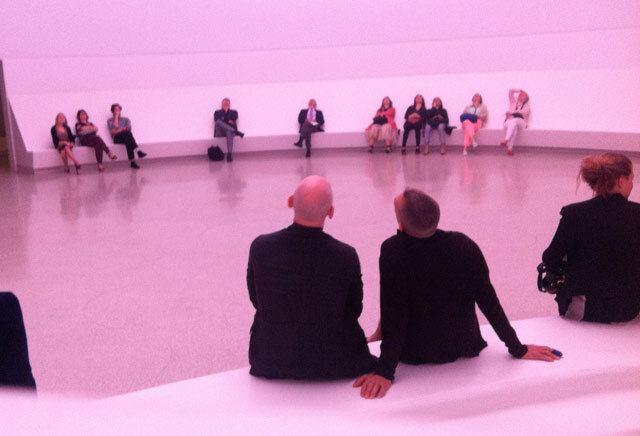 Turrell and his crew used stretched fabric to turn the building’s spiraling floors and skylight into six concentric ovals, he explained at today’s press preview. Each level has a ring of computer-controlled LED lights around the bottom. The result is a pulsing spectrum of ovals that gradually change color — from peach to tan to pink, from pale yellow to banana yellow to gray to white, from lavender to deep purple to electric blue. Most of the time, the ellipses are all different shades of the same color, but during the slow transitions, you may get two at once. From time to time, you may look down to see your fellow visitors’ faces washed in purple, or a woman’s salmon-colored pants glowing as if under a black light. 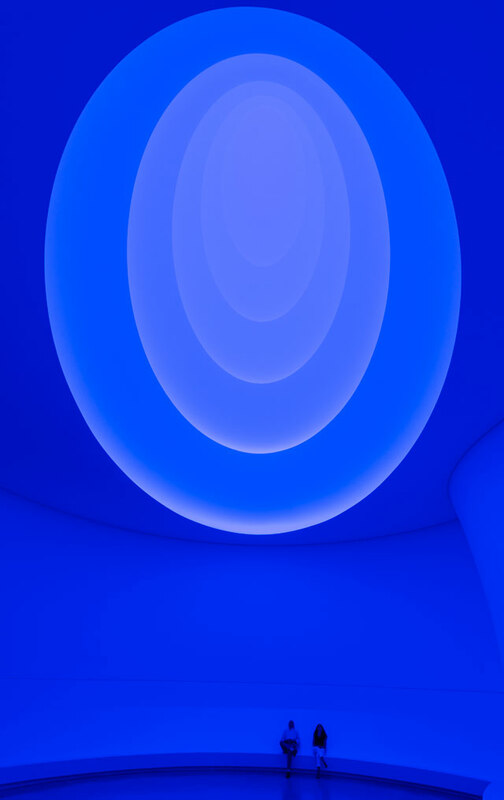 The complete and utter transformation of the space from physical architecture to abstract artwork is hard to understate, and impressive even if you’re familiar with Turrell’s work and have seen what he can do before. Somewhere in the back of your brain, you know that you’re looking at a shape composed of the white ramps of the Guggenheim Museum cast in light, but it doesn’t matter; your mind falls for all of Turrell’s tricks. Or maybe they’re not tricks — simply a way of opening up the invisible. Turrell spoke at the preview of “the thingness of light,” of making “spaces that would apprehend light for our perception,” of “this idea that light was no longer something that illuminated other things.” Those concepts would probably have sounded a lot more eccentric if they hadn’t come on the heels of seeing a piece that illustrates them perfectly. Though it is the centerpiece of the show, “Aten Reign” isn’t the only artwork in it. Annex galleries on the second and fifth floors feature a series of 1989–90 aquatint prints based on Turrell’s early projections as well as four other light works, three of which are early experiments (1967 and ’68) in the use of projections of intense masses of bright white light to explore how light, and our perceptions of it, can shape form. Their effectiveness varies, from “Ronin” (1968), which entrances with a column of light that resolves into a wedge up close, to “Prado (White”) (1967), which seems to have lost some of its power with a bygone novelty. The fourth light work, “Iltar,” from 1976, is one of Turrell’s Space Division Constructions, which “feature a divided room,” according to the museum’s wall text: “visitors stand in one space and encounter a ‘sensing space’ — the artist’s term for a room that gathers its light energy from another area.” In “Iltar,” the only illumination is a series of very low lights in the viewing space, which turn the sensing space into a flat, dark gray rectangle on the wall. The intention here is to create a Ganzfeld effect, a situation in which exposure to unstructured, unbounded light scrambles your mind and your vision. After waiting in a 15-minute line (just at the press preview!) to get into the room containing “Iltar,” I failed to have that experience. I saw different shades of darkness but felt no awareness of the koan (Turrell’s word, again according to the wall text) that he was aiming for. Where I did feel that was lying underneath “Aten Reign.” Towards the end of the preview, several people had the smart idea of lying down in the center of the lobby to get a view the benches don’t offer. I followed. Staring up at the piece, which now looked huge, I thought it might reach down and swallow me. The edges of the oculus began to shimmer and shift, like the way the sun seems to move when it’s blazing midday in the dessert. (Aten is the word for the sun in ancient Egyptian mythology.) The smallest ellipse suddenly began to disappear, its color changing and dissolving into the surrounding oval. Then, only after it had fully gone, it gradually reappeared, brightening until it held the center once more. It may as well have been a mirage. 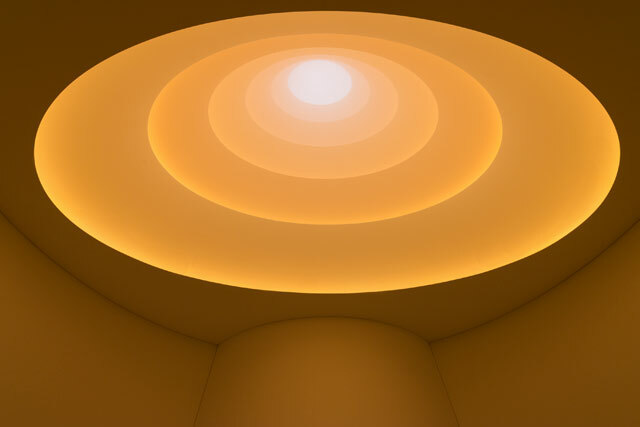 James Turrell opens at the Guggenheim Museum (1071 Fifth Avenue, Upper East Side, Manhattan) tomorrow, June 21, and will be on view through September 25.